The June Holidays are always a good time to take week-long breaks from work. However, even with a 'long' break, time just seems to fly.. but I managed to do something productive during my latest break. Bought more Ikea Billy Bookcases for more of my collection to go up on the new shelves, including some new items! You might have seen these before, but I recently tracked down the Gentleman version locally, which completes the collection of the NECA Claptraps! 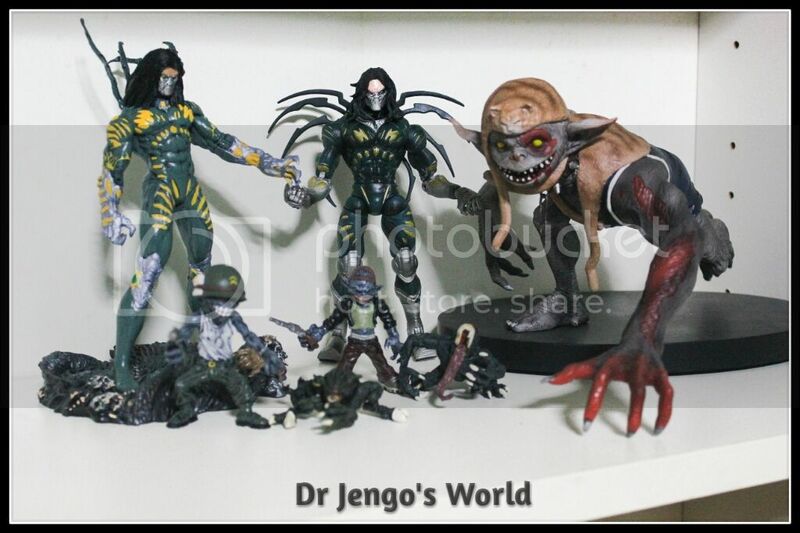 This reminds me of how disappointed I was when NECA didn't continue with producing the Vault Hunter figures. 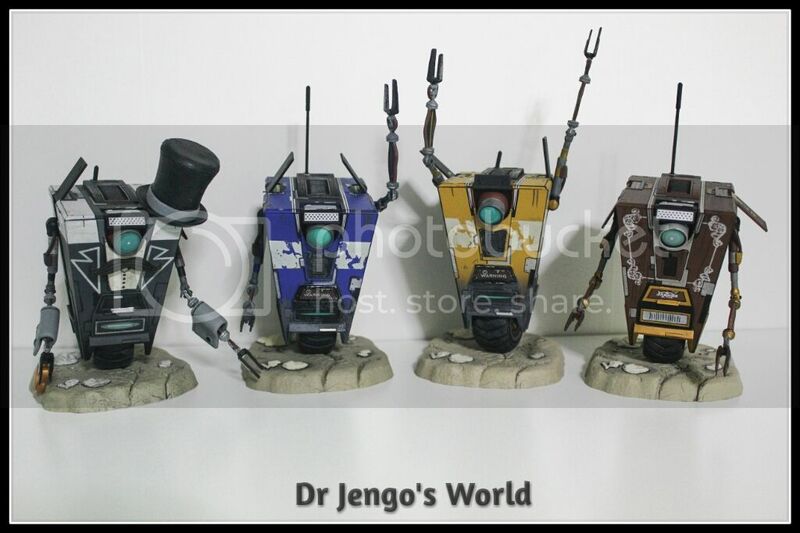 I would definitely have bought the entire lot of them and even more Claptrap variants. Even some of the popular NPCs would have been nice and I would have bought half a dozen bandits to create an army.. Ahh I can only dream now.. But hey! With SDCC just around the corner, I would love to hear an announcement of someone picking up the Borderlands license.. Maybe 1:12 figures? Nothing new here, just re-arranged some figures and decided to take another shot of my Darkness collection. Nothing new again here but with that major E3 announcement, this deserves another shot! 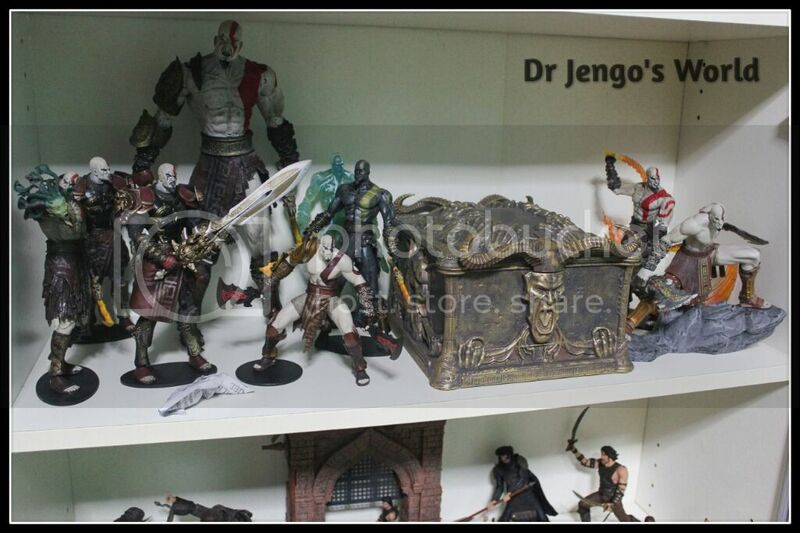 A bearded Kratos needs to join this collection! Where I'm going to place him is another question though.. 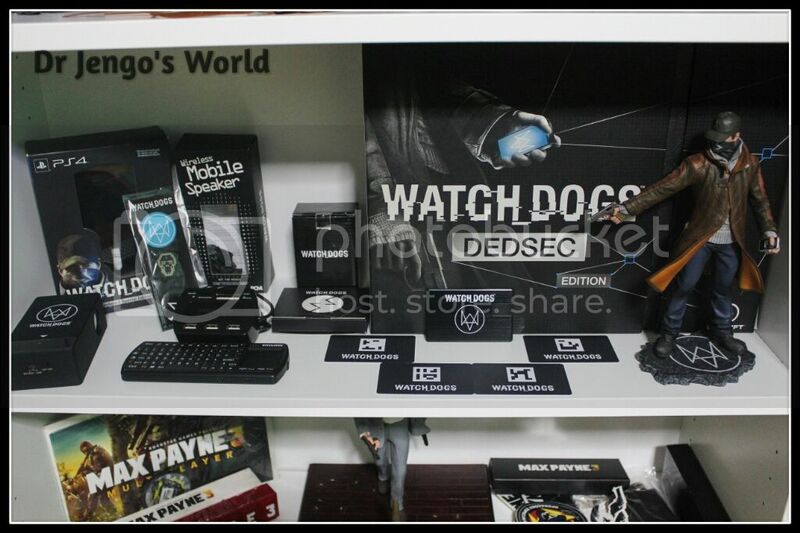 I have been wanting to expand the God of War collection with some bigger pieces but there's other priorities at the moment.. One day hopefully..
Watch Dogs! Another major announcement for E3, so I had to dig out these items so that they finally get their own shelf. 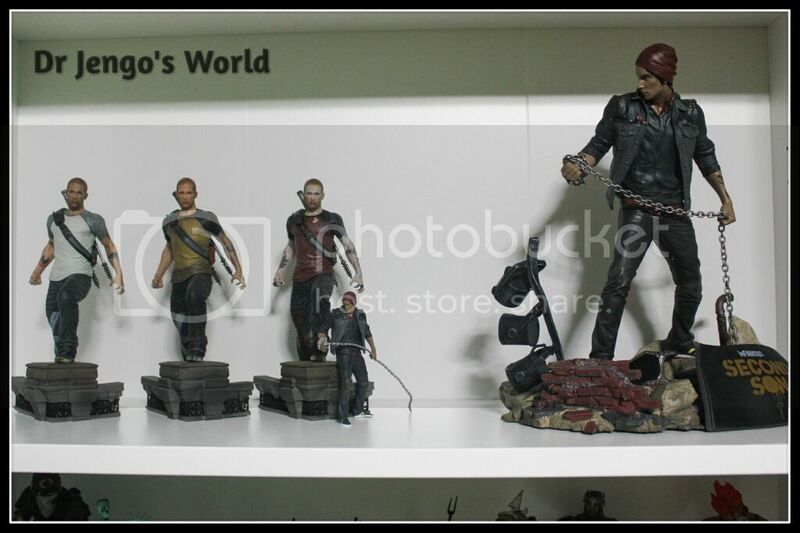 Very nice theme going with the collectibles, don't you think? Let's see what the sequel will bring to the collection at the end of the year.. Speaking of E3 announcements, I was quietly hoping for some news about a new game in the series. Didn't happen though. Got all the inFamous collectibles onto 1 shelf. A bit empty but hopefully will have something to add soon.. These guys deserve a better spot than the bottom shelves but they have to make do for now.. Should be able to put more of the PCS Collectibles' Mortal Kombat statues on display as I set up more shelves. Saved the best story for last..
With more and more additions coming in, some had to go.. 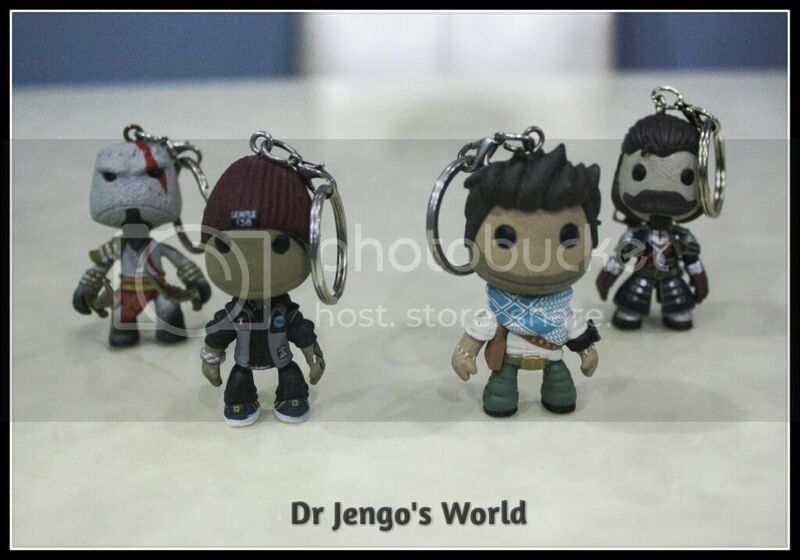 These Sackboy keyrings were on the list that were going to be up for sale. The idea was to take a group shot of them all and put it up for sale. Not sure what happened but I think it had something to do with Sony's E3 press conference. Lining these PlayStation Heroes up, I could swear I was cheering.. "Sony! Sony! Sony!" Decided to not only keep the collection but expand on it. So, if there's anyone who has the Bloodborne, The Last of Us Joel & Ellie, Uncharted 4 versions, do drop me a PM as I would love to add them to my collection! That's all for now.. 3 more shelves and a ton of collectibles are waiting to be shared. Check back again for more!